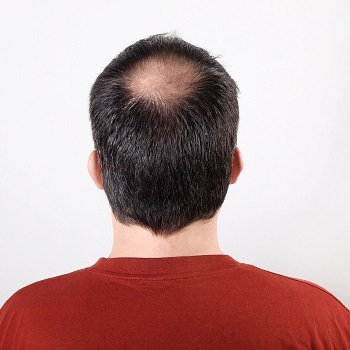 Male pattern baldness is the term given to the natural hair loss some men experience as they get older. Whether you eventually lose all your hair, or just get a little thin on top, it can be a challenging time. Even though male pattern baldness is hereditary and therefore not possible to prevent entirely, there are aspects a doctor can help you with. Our GPs can talk to you about your hair loss and recommend treatments where appropriate. They can also talk to you about your feelings regarding going bald, as this is something many men find tough to accept. Not all men will lose their hair in the same way. If you want a hint of what’s to come, take a look at the older male relatives in your family. You can inherit male pattern baldness from either side of your family, so you won’t necessarily end up with the same hair as your dad. You might notice a receding hairline, where your hair seems to be retreating from your forehead. You might also develop thin hair or a bald spot on the top of your head. Some men are unlucky and get both of these. Total baldness isn’t the norm here - most men find they’re left with a band of hair around the bottom half of their scalp. Because male pattern baldness is passed down through families, it’s not a condition that can be reversed or ‘cured’. However, there are various cosmetic options you can talk through with a doctor in order to see if they’re right for you, from transplants and implants to certain medications that can thicken your hair. Remember though, these only work for some people and there’s no guarantee they’ll help you. Many of them also come with possible side effects, so it’s important you consider if you are happy with this before proceeding. You should also be wary of trying products you read about in magazines or online. These will usually be too good to be true and you will probably be left out of pocket, with nothing to show for your effort. Always consult a doctor before trying any baldness treatments. While going bald won’t affect your physical health, it’s important to remember the mental strain it can put on some men. You might see your hair as a part of who you are, so losing it can cause more distress than your friends and family might realise. It’s not uncommon for men losing their hair to experience feelings of anxiety, depression and other common mental health issues. While you might be worried about making a fuss, it’s important to talk to someone if you’re struggling with the idea of going bald. Our doctors will be able to talk to you about what you’re going through and help you come to terms with the situation.